Toyohara Kunichika (1835-1900) One Hundred Roles of Baiko: Onoe Kikugoro V as Hiyoshi-maru, 1893. Oban. The last few years of the nineteenth century are really dominated by Toyohara Kunichika who died in 1900. He was the last of the great ukiyo-e artists and the last link to the past. He helped to reinvigorate the genre and to keep the waning public interest in kabuki theatre alive. 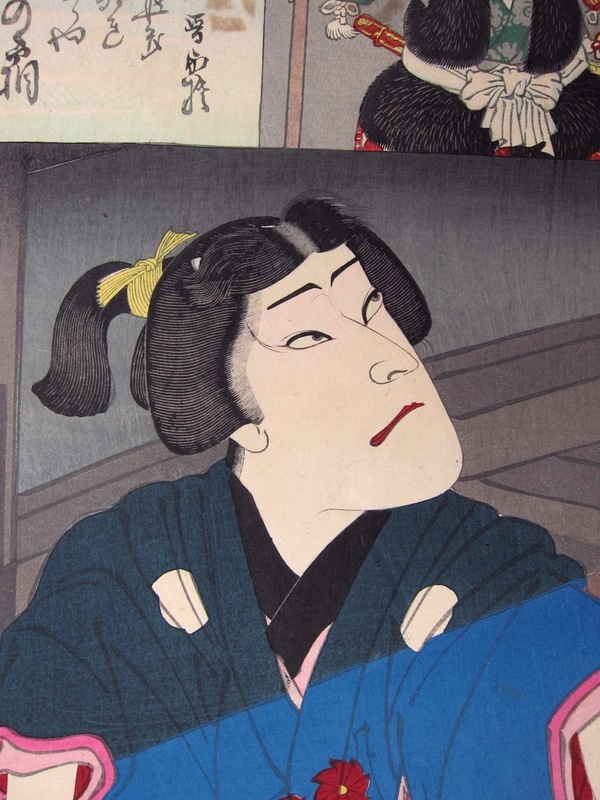 This print is from a series celebrating one hundred performances by the great kabuki star Onoe Kikugoro V, known to his fans as Baiko. Kunichika also produced a celebratory series of prints commemorating the 100 roles of Ichikawa Danjuro, the two enormous projects running concurrently with his single handed reinvention of the panoramic theatre triptych. 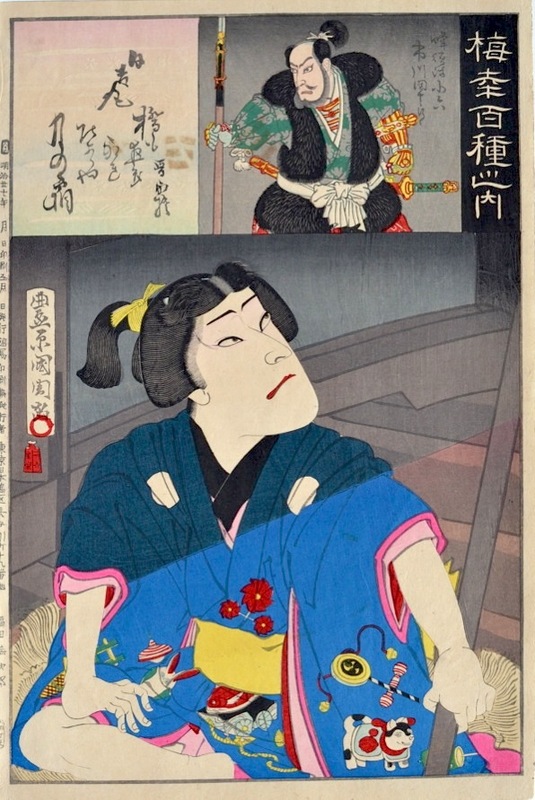 In this very fine late Meiji print, Kunichika shows the actor Baiko in the role of the child Hiyoshi-maru, (Bounty of the Sun) sitting on the steps of the Yahagi Bridge. Hiyoshi-maru was to grow up to become the great Japanese martial hero, Toyotomi Hideyoshi, 1537 - 1598. Hideyoshi was a pre-eminent daimyo, warrior, general, samurai, and politician of the Sengoku period who is regarded as Japan's second "great unifier”. He financed the construction, restoration and rebuilding of many temples standing today in Kyoto. Hideyoshi played an important role in the history of Christianity in Japan when he ordered the execution by crucifixion of twenty-six Christians. We see the young hero in the foreground, a beam of light across the lower part of his kimono illuminating the patterns of embroidered toys and playthings, whilst above the sober colours of adulthood predominate. The cartouche in the upper part of the print usually shows the other major role in the performance. In this case the other role is played by the actor Ichikawa Danjuro IX, as the robber and bandit Hachisuka Koroku. These prints are fantastic things… littered with mica and embossing, rich colours and thick paper and burnishing, they are masterpieces of lavish Meiji printing. Colour, condition and impression are all fine.